It's a journey worthy of kings. No wonder the experience is labelled the Palace on Wheels. The 14 coaches of the Palace On Wheels are named after former Rajput states. The names are romantic, mesmerizing... Kota, Jaipur, Udaipur, Jaisalmer, Jodhpur, Bikaner, Alwar, Sirohi, Kishangarh, Bundi, Dungarpur, Bharatpur, Jhalawar and Dholpur. It has been rated one of the ten best luxurious train journeys in the world. Offered on board are a series of restuarants, a library, a bar, lounges, individually designed saloons with en-suite bathrooms, personal attendants and a lot more. Traditional royal welcome at every station you visit. The history of Rajasthan dates back to 2500 BC. The greatest influence in Rajasthan was of the various Rajput dynasties. The Rajput kings and noblemen were famous for their valor, chivalry and elaborate code of honor. Their passion for architecture can be witnessed in the numerous magnificent monuments, palaces, "havelis", temples and forts that stand tall even today. 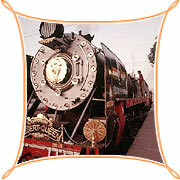 The Palace on Wheels tours make you experience all the luxuries worthy of the affluent Indian maharajas of yore. Exuberance and extravagance are the key words. This royal journey by palace on wheels is a first-hand experience of the lavish lifestyles of the Indian kings. The décor, food and hospitality speak of sheer luxury and opulence. Times have changed and winds have shifted, but the Palace On Wheels cruises along in its unique style, the kind only the Maharajas of yesteryears could have perpetuated and enjoyed. Today, of course, each traveller on board is treated like royalty in his or her own right. The exquisite & exclusive Palace on Wheels has luxurious cabins, wall-to-wall carpeting, a well stocked bar, two dining cars, and a very personalised service. Infact everything that could comprise of heaven on earth for a whole week. The festive fervor of Christmas catches up even amidst the sandy and earthy terrain of Rajasthan while you are aboard the Palace-On-Wheels. All passengers sing dance and make merry within the comfortable confines of the train. When the music is pulsating and spirits soaring, it is difficult to keep in control and you tend to go with the flow.